Design research on the UC Berkeley course planning and scheduling systems and interfaces, for the purpose of evaluating a potential redesign. Led synthesizing with affinity diagram & creating paper prototypes. Executed the project including survey, contextual inquiry, cognitive walkthrough, discount usability study, and paper prototyping. Crafted the user journey map. 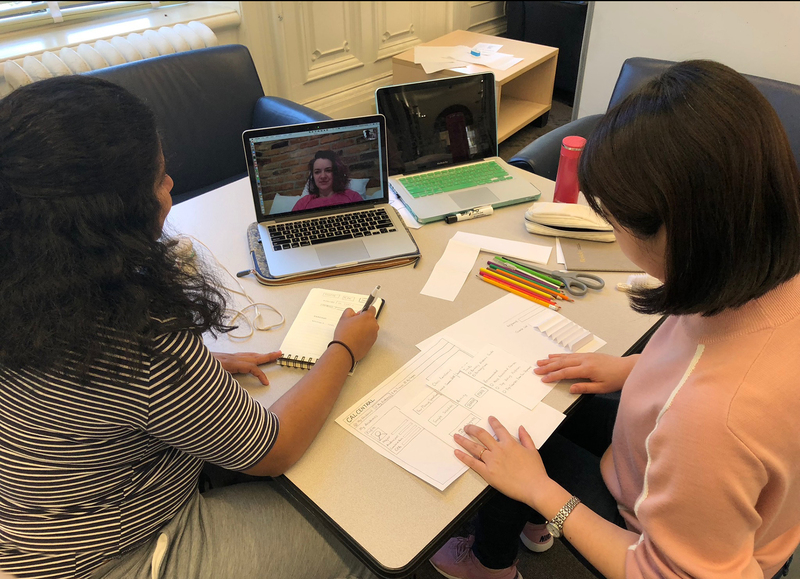 To gain a deeper understanding of how and why Cal students use the existing scheduling and planning systems and interfaces through conducting usability tests on the existing tools. To evaluate a potential redesign of the course scheduling and planning tools of the Calcentral portal by validating assumptions about Cal students experience of scheduling and planning courses. Regardless of experience, all participants ran into usability issues - problems with the search interface, inability to find the tools they needed, and confusing layouts. All participants have solved frustrations with the system by generating their own tools: some used paper while others used excel spreadsheets. For the usability, Paper got the highest “easy to use” rating (3.1), followed by Spreadsheet (3), then Berkeleytime (2.78) out of 5. The Multi-Year Planner of the CalCentral Portal has been rarely used. Even for those who used this tool, their opinions went to the negative end - “Not easy at all” and “Not that easy”. For the likelihood to recommend, respondents were most likely to recommend classes.berkeley.edu, Berkeleytime, and the SchedulePlanner (2.95, 2.95, and 2.89 respectively). 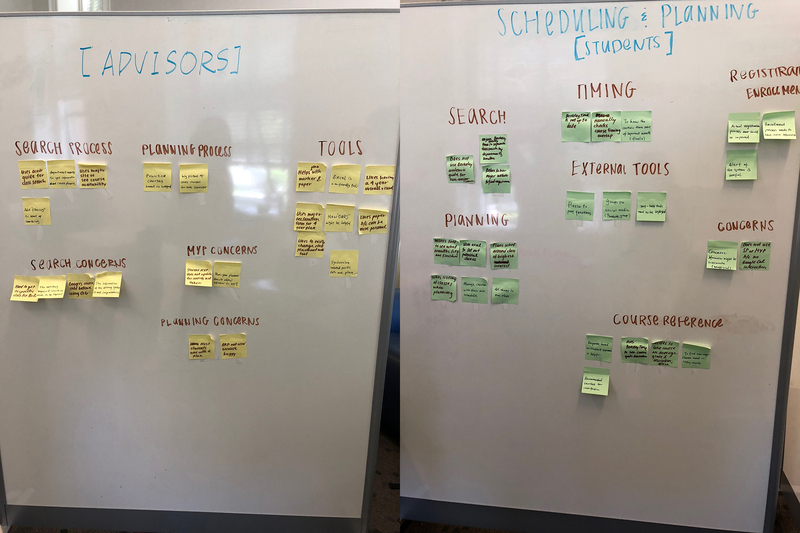 As all students must meet with academic advisors when they plan and schedule courses, we thought that conducting contextual inquiries with both students and academic advisors would allow us to dig deeper into the course planning and scheduling processes actually happen. 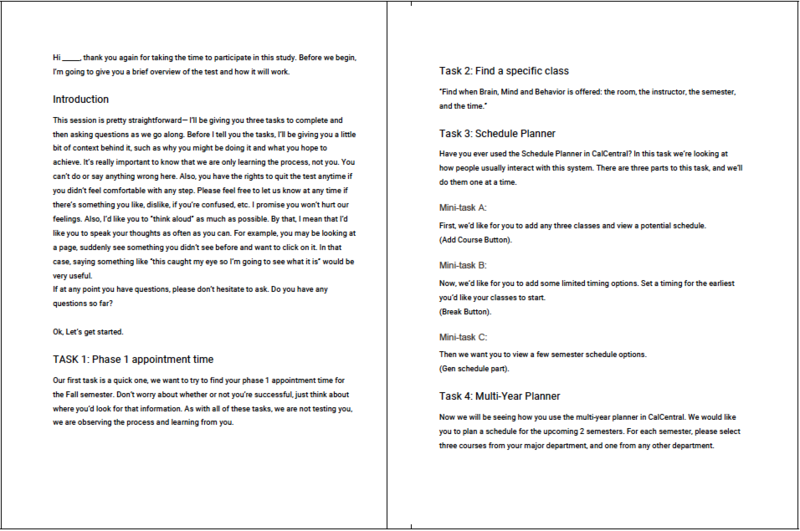 Different techniques (e.g., Excel spreadsheet, laminated paper and paper print-outs) had been developed to support students’ course planning and scheduling. Concerns that the available tools were not providing accurate information, since they were explicitly told by the system developer that the system (i.e., CalCentral) sometimes didn’t function properly. Ideal tools were described as Visual, Flexible, and Familiar. The old system Berkeley Time was valued more than the existing Berkeley Academic Guide as the former system offered usable, legible and friendly course searching functions. 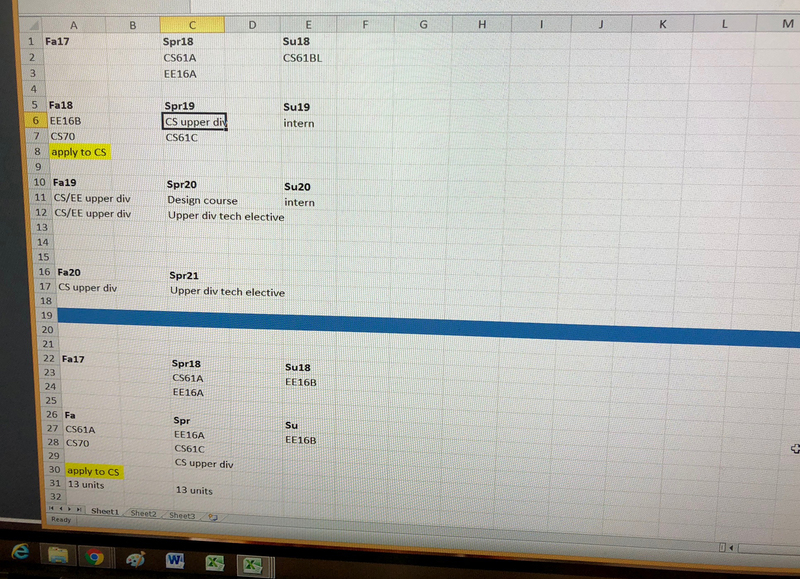 Spreadsheets either with paper or Excel were used to restore and keep track of the course plans and schedules. Synchronized into personal Google calendar to ensure no overlapping between courses and other events. Based on the insights from the contextual inquiries, the affinity diagram was employed to further identify clusters and patterns. 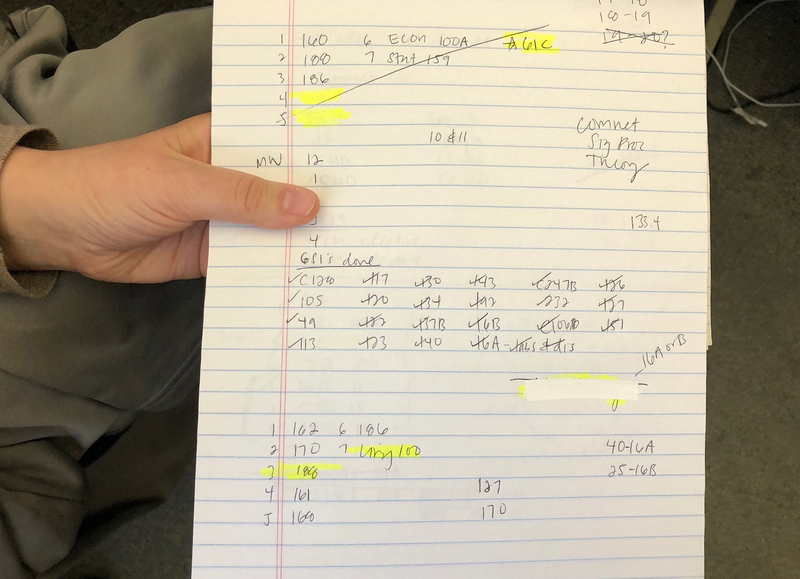 A bunch of common clusters was found between the student group and advisor group, which meant that both groups experienced some similar problems when they scheduled and planned courses with the current system. 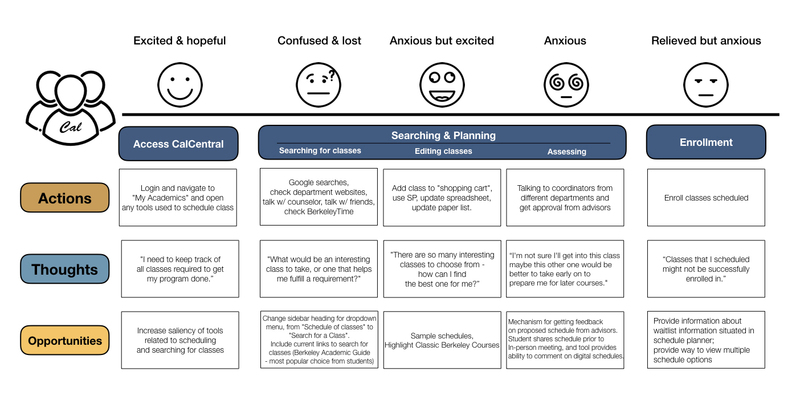 With the comprehensive insights synthesis, we mapped out a user journey to capture a holistic experience of Cal students during their interaction with the existing tools to schedule and plan their courses. Specifically, this user journey map documented student feelings, points and delights. Also, we created a layer - opportunity of the user journey map to generate ideas for the redesign and improvement. 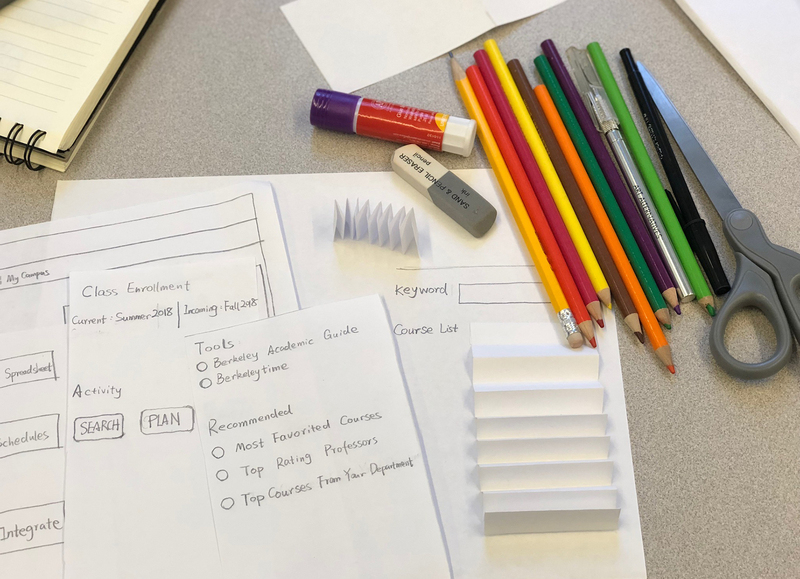 As one of the objectives was to evaluate potential redesign of the existing course scheduling and planning tools, the paper prototyping was created to visualize and test the ideas drawn from the user research. All group members performed a cognitive walkthrough of the paper prototypes. Specifically, one person did the walkthrough, one reminded them of questions and goals, and one person took notes. Each person performed the same 5 tasks, but with details changed to keep the activity constrained but allow for some variety in details. Redesigning parts of the CalCentral portal is good and useful, but challenging: in some ways it feels as though larger changes are needed, so sticking to our initial scope was a challenge. A easy one-click transition between tasks pertaining to scheduling, planning, and enrolling was discovered. Steve Fadden. UX Research Manager at Salesforce. Comprehensive research methods were used to identify Cal student needs, wants, and behaviors under the various contexts related to course planning & scheduling. The Cal student journey map of course planning & scheduling provided the manager of the CalCentral with a deep understanding of Cal students experience. Design research is teamwork! Without collaboration with the team, it will be very difficult for an individual researcher to effectively uncover insights from the user. Paper prototyping is efficient for quickly testing potential ideas to advance a redesign.